Printing error in Dareth vs. Nindroid? I bought this polybag, #5002144-1, from TRU a few weeks back. When I opened it I thought the printing on the 'Nindroid' figure looked a bit off, but I didn't have any others on hand to compare it to and figured I was just remembering wrong. Fast forward to today, when I finally have a proper look at the fig next to my other Nindroids, and I find that the head printing is indeed different. The face is much smaller and the printing is one continuous design instead of divided between the front and back. The rest of the figure is completely fine; only the head is different. Is this meant to be like this? Or did I receive a mistake? I've attached an image below. On the right is one of the normal nindroids. The one on the left is what I got with the poly. If anyone else noticed this difference, please let me know. Sorry for the poor quality, I took the picture with my phone. I noticed this too. I guess it could be that the print area is different between the Chinese factory where this was made and whatever factory where the one from the other sets was made, and they neglected to adjust the design to match. Or perhaps it could have been some kind of computer error. Either way, I don't think we'll see either version going up in value tremendously, and Nindroid Warriors are common enough that it'd be easy for fans who are bothered by the awkward proportions of the polybag one to substitute a "normal" one. 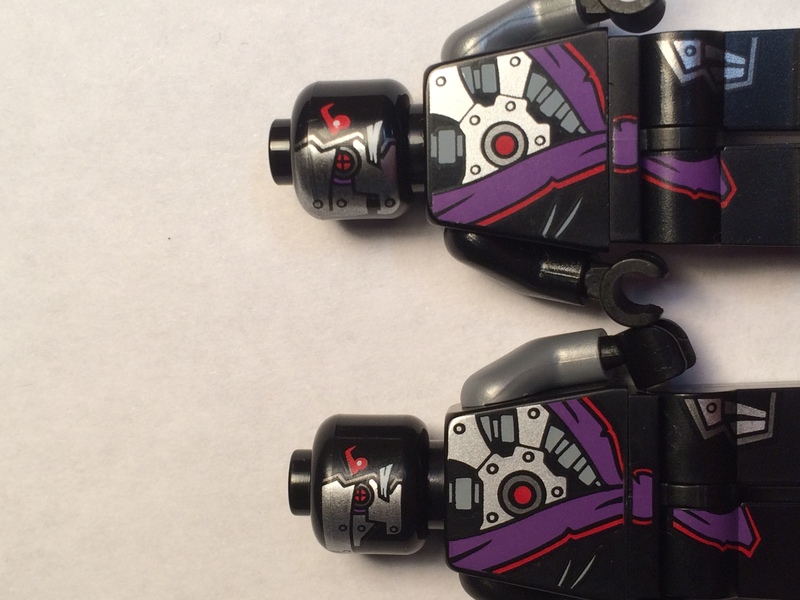 I noticed the difference in printing in some Lego Pharaoh's quest mummies as well. That does make sense if Lego gets the figs made in different factories. Reminds me of a Kai misprint I got from the first wave of sets, which was expanded as much as this is squished. Also, the Dareth minifigure torso is technically a misprint on the back, not being faithful to the source material and having a star in place of a pair of gothic style wings. I don't personally think it matters.